Chris Larson ... ""A little something I just flowered. I saw it first I think, in Die Bromelie in late 2011 when it was still T. ’Calavera’. A plant which grows between 800 to 1000m. Later it was described as T. carrilloi. For a couple of months I have been watching the spike come up. I cannot see any confusion with T. zacapanensis, as referred to on the disc. 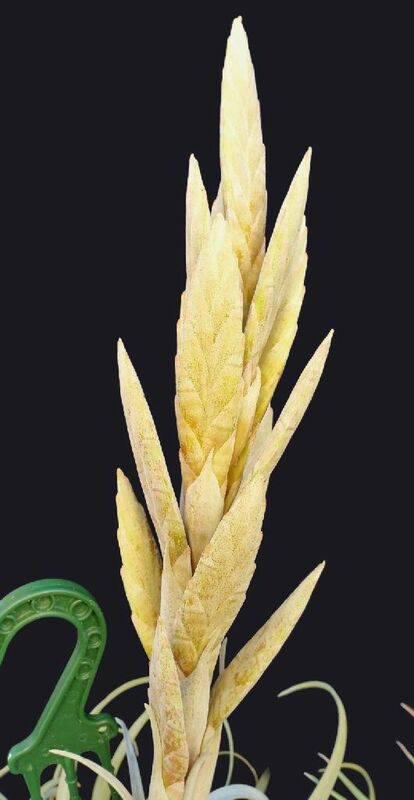 Leaf shape is very different – no way they can be mistaken – and flower spike arrangement is very different. 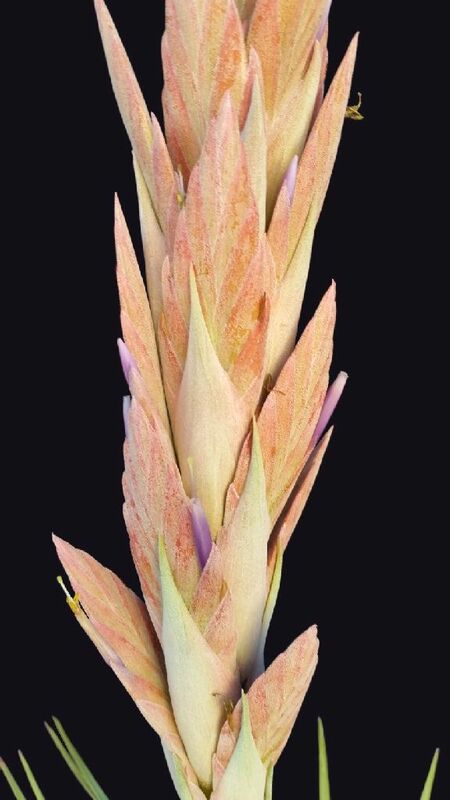 I wonder what my plant would be like if it reached full size – like the photos in Die Bromelie show? Or if it is a variation across the habitat. Derek Butcher ... "Chris: Both Renate and Eric consider zacapanensis and carrilloi synonymous. Now for history. In 2010 we first saw zacapanensis published by the Guatemalans but in 2011 we saw this amended by Lotte and Renate. In 2013 we saw carrilloi published by the Guatemalans in an obscure journal (Could it be they did not want the Germans fiddling with it?) 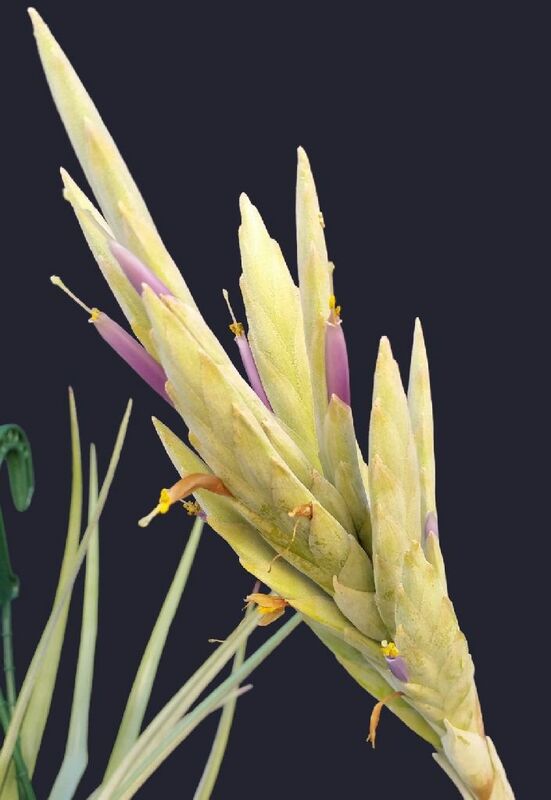 As as an aside Veliz was involved with both descriptions and he was the one who wrote the Guide to Guatemalan Tillandsias. You will find this in the DVD marked suspect because I feel it is full of anomalies. In 2014 I received photos from my Thai friends of carrilloi which they had got from Guatemala and which did not fit the description of either carrilloi/zacapanensis. I smelt something fishy. So all I can suggest is that when your carrilloi flowers you check it against the descriptions and then decide if the name is right." 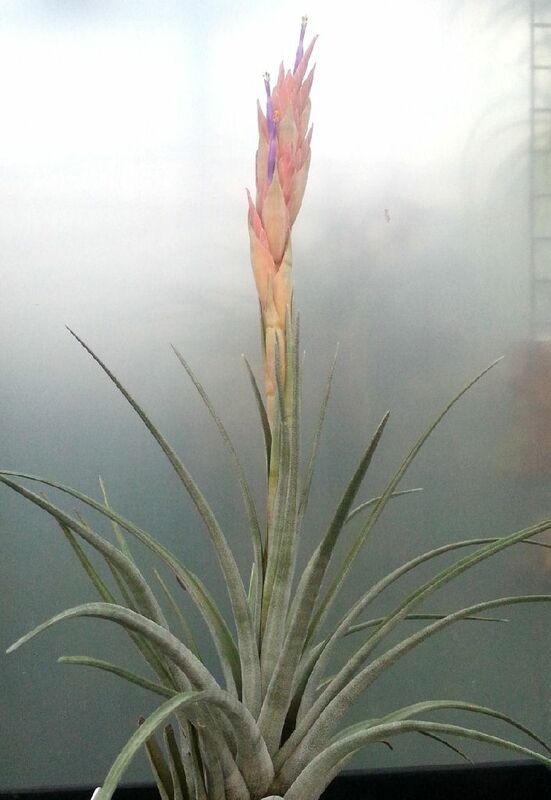 Chris Larson ... "The first 2 photos are different T. zacapanensis in flower, or nearly. The one that has flowers (centre) has flowered a little small & has been in a darker position. The other (left) is beginning to colour. The comparative shots were a bit blurry. I’ll redo the photos later and post them then. 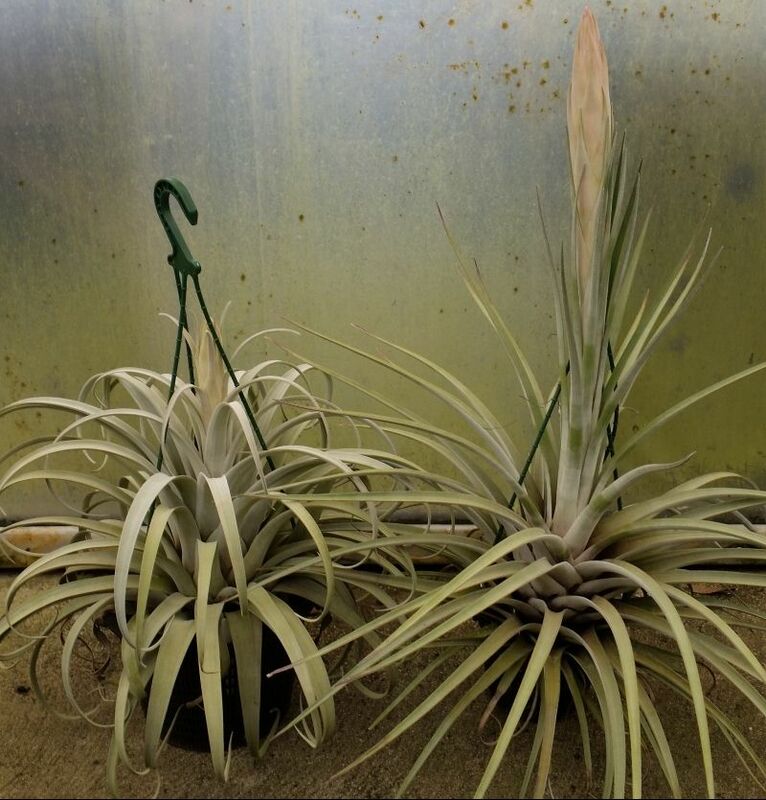 These are the larger carrilloi (left) and the smaller zacapanensis (right) shown flowering now.